How can I label a shift with a name? I want to have a shift that can be seen as words rather than times. Sometimes you will want to have a shift that is displayed in text rather than time. You can do this by setting up a shift name in your settings. Choose the Scheduling sub category to the left. Now that option is available to select as the shift name or label. Go to the schedule tab > Popular shifts. Click the pen symbol to create a new popular shift. Click the blue + New Shift. 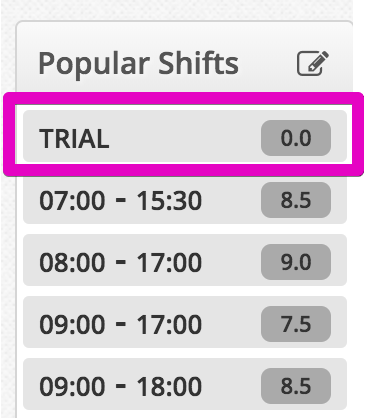 A handy tip to make sure this shift shows at the top of your popular shift list is to enter in a start time that is earlier than the rest of your popular shifts. For eg. 5am. Then enter the end time for half an hour later. For eg. 5am - 5.30am. The Start Time and End Time can appear as a time, blank or as a shift name you have created. In my example below you will see my new shift as TRIAL. So I have set the Start Time as Trial and the End Time as Blank. Please Note: If the shift you have created has two words, for example On Call. Simply add "On" and "Call" as separate shift names in the Settings and set the Start Time as On and the End Time as Call. As you can see, my new TRIAL shift is appearing at the top of my popular shifts so I can easily find it and drop it into my schedule. It is also showing as 0 hours so it will not appear in your scheduled hours and labour costs for the week.